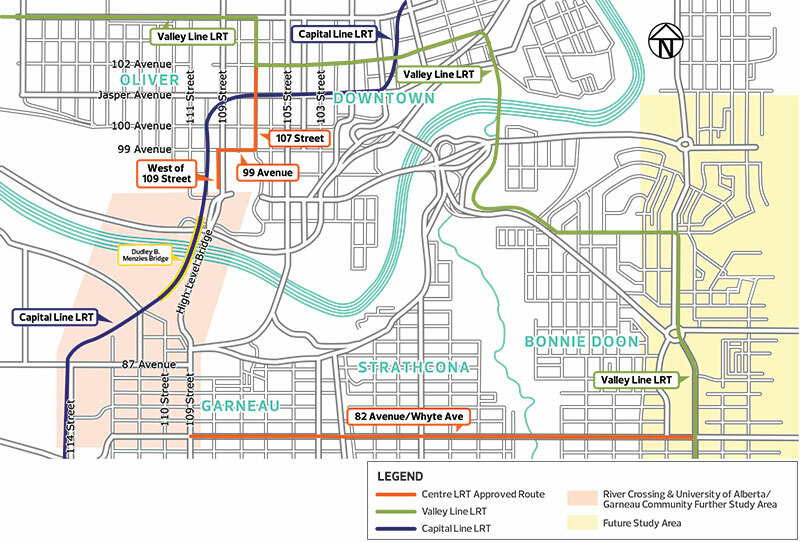 The Central LRT route was identified in the City’s Long Term LRT Network Plan (adopted by City Council in 2009) and will provide opportunities for seamless connections between Downtown, the Alberta Legislature, the University of Alberta, Strathcona, Bonnie Doon, east Edmonton and the wider LRT network. The Downtown (102 Avenue to the North Saskatchewan River) and Whyte Avenue (83 Street to 109 Street) segments of the Centre LRT route were approved for further concept level planning by City Council on August 21, 2018 (Item 6.7). Since the preferred route was shared for feedback in February 2018, the City has learned that the river crossing and the route through the University of Alberta Area/ The Garneau community requires further study and stakeholder involvement. In keeping with our commitment to continue to explore options and possible approaches to effectively address any issues raised by the public and stakeholders, the river crossing and route through the University of Alberta area/Garneau community segments were not taken with the rest of the preferred route for City Council approval. Note: there is no timeline for construction of the route. Whyte Avenue emerged as the preferred east/west route; however, this comes with challenges. This segment will provide better connections to key destinations. Tradeoffs need to be considered to manage potential impacts to parking, trees, medians, pedestrian space and vehicle space. A river crossing study is underway to help determine the preferred river crossing option. Consultation with stakeholders in the University of Alberta/Garneau community area will continue to help determine a preferred route in this area. How did this become the preferred route? City policy provides guidance and public input helps inform and identify important destinations, as well as concerns and opportunities in the study area. Technical analysis conducted a corridor screening of the entire Centre LRT Study project area including every possible street and avenue between 104 Avenue and 76 Avenue and between 116 Street to 83 Street. Initial Screenings: Initial screening process removed corridors that had significant feasibility issues. These include steep gradients, narrow corridor widths, constructability issues, significant environmental issues and other impacts. Low Performance: Evaluation removed lower/poor performing segments like segments that performed poorly against a single category or across multiple categories. Viable Routes: With remaining segments, potential routes were developed and further evaluated against project categories such as route length, the potential for providing stops close to key destinations and to existing and planned transit. Preferred Route: The preferred route performed the best at both a route and segment level against the predetermined criteria. While there are trade-offs that have to be made for every option, the preferred route is considered to minimize the impacts and best meet the project objectives. The City will continue to explore options and possible approaches to mitigate any issues raised by the public and stakeholders prior to City Council approval of the route. Since June 2017, the Centre LRT Study project team has been gathering input to better understand local perspectives on the future route. Engagement activities included public events, street team interactions, one-on-one meetings and surveys. The City’s LRT Network Plan includes six LRT lines extending from Downtown to the Northwest, Northeast, East, Southeast, South and West sections of the city. This new central LRT route will provide the missing east connection completing the LRT Network Plan. It will also enhance Edmonton as an extraordinary place to live, work, play and visit by increasing sustainable transportation mode choices that both support our City’s growth and consider our environmental footprint. This new central LRT route will provide the missing east connection completing the LRT Network Plan. The Centre LRT Study will research possible street and avenue options to determine the best location for a Central LRT route, stop locations along the way and the optimum track alignment (where the tracks fit in the roadway). This new LRT route will use a low‐floor, urban‐style LRT that operates at street‐level in dedicated lanes, using traffic signals to flow with traffic through intersections. It features frequent, sidewalk‐level stops and can fit seamlessly into communities. It is the same LRT system as the Valley Line LRT currently being constructed between Mill Woods and Downtown. It is intended to connect with the Valley Line in east Edmonton and will cross the river to connect again Downtown. February 7, 2018 - Structural feasibility study and conceptual bridge modification strategy report. LRT Network Plan and using new low-floor LRT vehicles.